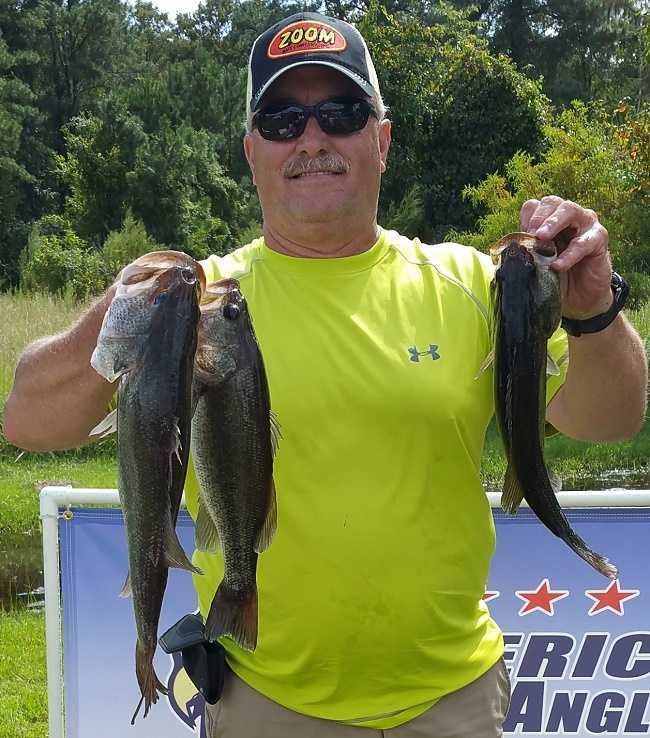 On September 9, 2017 Division 15 held its 1th one day tournament of the 2018 Ram American Fishing Tour season ran out of Tranters Creek in Washington, NC. Taking first place was Curtis Leggett of Snow Hill, NC; he caught 3 bass weighing 7.02 pounds for a check for $249. Curtis also had the TWT for a check for $70.00, all totaling $310.00. Chris caught his fish a little of everything. In second among the competitors, Andrew Skinner of Winterville, NC, caught 5 bass weighing 6.83 pounds. Andrew pocketed a check for $94. Taking third place, Chad Conwell of Hookerton, NC, caught 3 bass weighing 6.36 pounds. In fourth place, Dewey Castleberry of Hubert, NC, caught 3 bass weighing 6.25 pounds. Dewey also had the Big Bass of the tournament weighing 4.21 pounds, he was rewarded with a check for $70. David Price of Kealy, NC, rounded out the top five competitors with 5 bass weighing 5.49 pounds. Winning a 10% discount at Moore’s BBQ was Rick West of Rocky Mount. The next divisional tournament will be held 10/7/2017 on NE Cape Fear River in Castle Hayne, NC. This tournament will be an OPEN tournament and anyone can fish. I would like to thank our local sponsor for supporting this tournament.